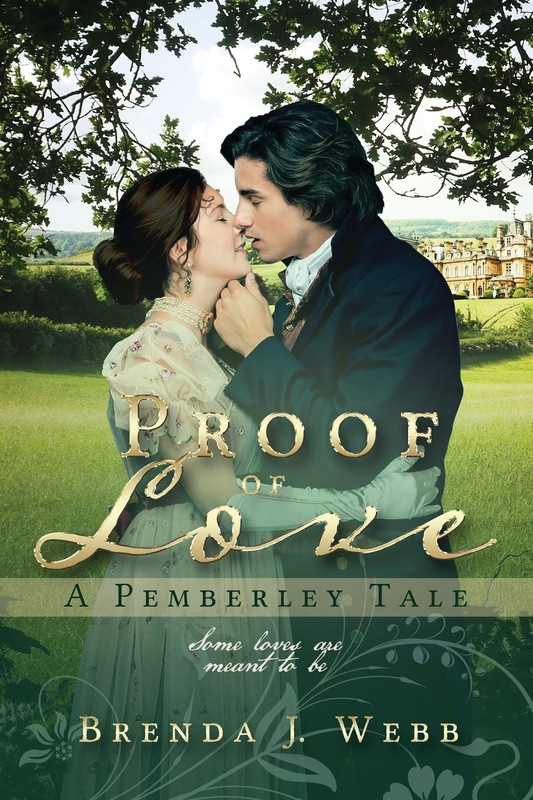 I am so proud to be visiting again with you and your lovely readers, Ceri, Thank you for inviting me to promote my latest novel, Proof Of Love – A Pemberley Tale, and to give away some copies. In this story I wrote a much younger Darcy and Elizabeth than I had in the past and I hope I succeeded in showing how they matured as the story progressed. Today I shall be sharing with your readers the blurb from the book and an excerpt. I hope everyone will tell me their thoughts after reading it. During his second year at Cambridge, a young Fitzwilliam Darcy accompanies a classmate to Lucas Lodge in Meryton for the holidays. Whilst there, he encounters a girl of sixteen who instantly captures his attention and soon after, his heart. Yet, because Elizabeth Bennet could never meet his relations’ expectations and he cannot abide her distasteful family, he returns to the university vowing to forget her. The moment Jane reached the pinnacle of Oakham Mount, she spied Elizabeth sitting in her favourite spot beneath the tallest tree, her back against the trunk. Though her knees were pulled up and her head was lying upon them with her eyes closed, Jane had no doubt Elizabeth was aware of her presence well before she stood in front of her. Elizabeth understood Jane’s meaning. “It never came to that,” she stated dryly, busily brushing phantom bits of leaves off her skirt. “You never consummated your union?” Jane declared loudly enough that Elizabeth looked around to be certain no one was there to hear. Proof of Love is available to buy now, both in e-book and paperback! You can get it at Amazon US, Amazon UK, Amazon CA and elsewhere, or add it to your Goodreads shelf. 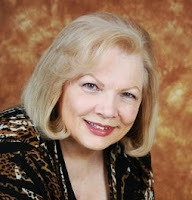 Brenda's books are also available on Nook. 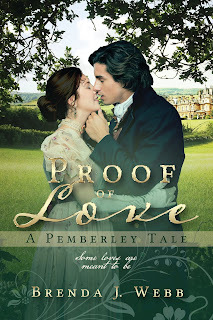 Brenda has brought an amazing giveaway - 2 winners will win an ebook of Proof of Love, open internationally, and 2 readers in the US or Canada can win a signed paperback! To enter, comment on this blog post by the end of the day on Friday 20 July. Let us know what you think of the excerpt, or recommend your favourite of Brenda's previous books. Please indicate if you are in the US or Canada so I know whether to include you in the paperback giveaway, and make sure you leave me some way to contact you. Thank you so much Brenda, for the guest post and this fantastic giveaway! What a lovely excerpt. So seldom do we catch a glimpse of Elizabeth in such a manner,wishing for her marriage to be annulled in an effort to cease all future contact right Mr Darcy. Gosh! It seems she has little choice but to grin and bear it. Interesting that Jane has realised that John Lucas would be no match for her,would be the total antithesis of what she'd require and yearn for in a loving,respectable and honourable partner. What's even more revealing is the fact that she numbers Mr Darcy as a man better suited to her intellectually and psychologically. Looking forward to seeing Elizabeth take Jane's advice on board,learn the merits of her newly acquired husband and realise they are a very good match,given time,patience and a pinch of mutual understanding!! Please don't enter me in the giveaway as I was lucky enough to win a copy of Brenda's book on another site. I liked Jane's perception here too Mary. Elizabeth seems to be being willfully blind. What an excerpt. I love this Darcy and Elizabeth... although I wanted to strangle both of them at every turn. Whew!! We have to remember that this is a much younger Lizzy. So her actions are childish at times. Great excerpt choice. Blessings on the launch of this work. Thanks Ceri for hosting. That's a good point, Jeanne, a younger Lizzy is likely to behave in a less-mature way. Hopefully the reader can make allowance for her. It does sound good doesn't it! Good luck in the giveaway. I really enjoy younger D&E stories. I also love it when Jane is a little stronger and more sensible as well. Thank you for sharing. I can’t wait to read it! Thank you for commenting, Brenda, and thank you for the generous giveaway! Great excerpt! I love Brenda's books and am excited to read this one. I don't live in Canada or the US so I can't apply for the giveaway. But just wanted to say congratulations to Brenda! Hi Daniela, thanks for commenting. You can't join in the giveaway for the signed paperback, but you can be included in the ebook giveaway if you would like. Oh dear. After such an emotional excerpt, I'm totally hooked! It is reassuring that ELizabeth has someone to talk to about her froced marriage, and I enjoy a mature Jane who is quite perceptive about people's personality, and in this case, not looking at the world through rose coloured glasses. I feel that this Jane and this Elizabeth complement each other beautifully, which is very true to canon. Thank you for the review and thank you for the giveaway as well! I loved the giveaway too, Agnes! Good luck in the giveaway. A second read is a wonderful compliment to the author. Thanks for commenting, Jen! Can't wait to read the story! I hope you enjoy it when you read it, Mary Beth. Oh Elizabeth, give him chance...lovely excerpt. I am so looking forward to reading this one! Thank you for a chance at the giveaway! Hello Ceri, thanks to you and Brenda for this post! I like the idea of a younger Darcy who falls in love with a teen Elizabeth! There aren't many books with our dear couple so young! Can I ask Brenda where the idea come from? Great question, Loren, which I see that Brenda has ansewred. It is wonderful to see Brenda's book Proof of Love featured here. Seeing a younger Elizabet and how she reacted to a difficult situation was in interesting. But as usual Brenda's story was quite a journey. Glad you enjoyed it Maureen! Thank you for your reply Brenda! It always surprises me that authors can come up with new plots for JAFF, they are so inventive! I think you are right, Rita, I forsee excitement ahead! I know what you mean too about meaning for years to try reading particular authors. There are so many out there that I want to try, I just don't have time to read all I'd like to! Hopefully this year will be the year that you give Brenda's books a try. Great excerpt. I especially loved Jane saying “your Mr Darcy.” I am US resident. Glad you enjoyed it, Denise, and good luck in the giveaway. Great except. I’m curious to know what cause Darcy & Elizabeth to marry. I’m already liking this Darcy. Congrats on your newest release. I’m looking forward to reading it! I haven't read this yet, Dung, so I'm also eager to know what caused them to marry! I hope you enjoy this book when you read it. Looking forward to reading this one. E didn't come off as childish to me here. I love Jane's voice in this excerpt. Thanks for the giveaway. I live in the US. Hi Kneyda. I agree that E doesn't come off as childish, but she is quite put out and maybe a little petulant. I wonder how she will be in the rest of the story? I am glad to hear that you are writing a sequel to this. Does Proof of Love have its own story arc or does the story conclude in book 2? Great excerpt Brenda and funny too! I enjoyed the exchange between Lizzie and Jane. I'm intrigued as to what might happen next. Where do Darcy and Lizzie go from here? I'd love to win a copy - if I don't I'll certainly buy one. All the best with this release, Brenda. FYI I'm in the UK. Thanks Elaine! Good luck with the giveawy. Thanks for sharing this great excerpt Brenda, it's such a lovely book. Congratulations on the release. I love reading this tempting excerpt. It gives us so much (Darcy and Lizzy already married but have not consummated their marriage) and leaves us on tenterhooks. Jane is a dear sister and shows her tender side when Lizzy is in need of comforting. Thank you for sharing it and offering the book as prizes, Brenda. I'm international so count me in for the e-book, Ceri. Will do, Sylvia, good luck with the giveawy! Thought I commented already.....wonderful excerpt. Looking forward to another great read from Brenda. Congratulations!